A case of acute optic neuritis. A. 1.5 Tesla, contrast-enhanced spin echo T1-weighted, fat-suppressed coronal MRI through the orbits shows enlargement and contrast enhancement of the left optic nerve in the retrobulbar portion (arrow). B. Coronal spin echo T1-weighted, fat-suppressed MRI of the same patient shows enlargement and contrast enhancement of the nerve in a parasagittal oblique section (arrow). Classically, patients with optic neuritis are young, are often female, and have subacute vision loss associated with pain on eye movement. Patients with MS may have recurrent attacks of optic neuritis,  which means that a history of previous episodes of decreased vision in the same or fellow eye may be elicited. NMO is characterized by often severe, bilateral optic neuritis and myelitis in a close temporal relationship. [6, 7, 8, 9] However, optic neuritis can occasionally precede the myelopathy. Decreased pupillary light reaction in the affected eye: A relative afferent pupillary defect (RAPD) or Marcus Gunn pupil commonly is found. In bilateral cases, the RAPD may not be apparent. Visual evoked potentials (VEPs) can be considered in patients with suspected optic neuritis. They may be abnormal even when MRI of the optic nerve is normal. VEPs often show a loss of P100 response in the acute phase. P100 recovers with time, but it usually shows a markedly prolonged latency that persists indefinitely, even after clinical recovery. Pharmacologic therapy in optic neuritis (ON) is directed at ameliorating the acute symptoms of pain and decreased vision caused by demyelinating inflammation of the nerve; varying regimens of corticosteroids have been used for this purpose. For patient education information, see Multiple Sclerosis. Most cases of optic neuritis are associated with MS, even though optic neuritis can occur in isolation. In MS-associated and isolated, monosymptomatic optic neuritis, the cause is presumed to be an autoimmune reaction that results in a demyelinating inflammation of the nerve. Pathologic studies in patients with optic neuritis associated with MS have shown that the demyelinative lesions in the optic nerve are similar to the MS plaques seen in the brain, with an inflammatory response marked by perivascular cuffing, T cells, and plasma cells. However, little is known about the pathology of isolated optic neuritis. In a single case of chronic, isolated optic neuritis, a biopsy specimen showed the presence of perivascular lymphocytic infiltration, multifocal demyelination, and reactive astrocytosis in the retrobulbar portion of the optic nerve. Abnormal intrathecal immunoglobulin G (IgG) synthesis, reflected as the presence of oligoclonal bands in the cerebrospinal fluid (CSF), is found in 60-70% of patients with isolated optic neuritis, suggesting an immunologic etiology similar to MS.
Studies from Sweden and Denmark have reported an annual incidence of 4-5 cases of new-onset optic neuritis per 100,000 persons. Patients living in temperate climates seem to be predisposed to optic neuritis. Typically, patients with first-time, acute optic neuritis are young adults aged 20-45 years. Atypical cases of optic neuritis may be seen in elderly patients. Bilateral optic neuritis in childhood is not uncommon, and it is believed there is less risk of progression to MS. Patients with silent demyelinative lesions elsewhere in the brain, observed on magnetic resonance imaging (MRI) performed at the initial presentation, are more likely to develop definite MS in the long term than are patients with isolated optic neuritis. In addition, patients who have recurrent episodes of optic neuritis may be more likely to develop MS. The ten-year risk of developing clinically definite MS following a single episode of optic neuritis was 38% in the entire ONTT study group; the twelve-year risk was 40%. Most of those who developed MS did so within the first five years after the initial episode of optic neuritis. The strongest predictor of MS in the study group was the presence of brain lesions on MRI at the time of the optic neuritis episode. Within the study group, patients with at least one brain lesion on MRI at the time of the optic neuritis episode had a 56% risk of developing MS within 10 years. Patients with "normal" MRI findings have a 16% risk of progression to clinically definite MS at five-year follow-up, which increases to a 22% risk of developing MS within ten years. Most patients with relapsing NMO have an aggressive form of the disease that is associated with frequent and severe exacerbations and poor prognosis. Beck RW, Smith CH, Gal RL, et al. Neurologic impairment 10 years after optic neuritis. Arch Neurol. 2004 Sep. 61(9):1386-9. [Medline]. Atkins EJ, Biousse V, Newman NJ. The natural history of optic neuritis. Rev Neurol Dis. 2006 Spring. 3(2):45-56. [Medline]. Flanagan P, Zele AJ. Chromatic and luminance losses with multiple sclerosis and optic neuritis measured using dynamic random luminance contrast noise. Ophthalmic Physiol Opt. 2004 May. 24(3):225-33. [Medline]. de Stoppelaar JD. [Bacteria as cause of dental caries]. Tijdschr Ziekenverpl. 1975 Nov 18. 28(23):1094-7. [Medline]. Wingerchuk DM, Lennon VA, Lucchinetti CF, et al. The spectrum of neuromyelitis optica. Lancet Neurol. 2007. 6(9):810-815. Wingerchuk DM, Lennon VA, Pittock SJ, Lucchinetti CF, Weinshenker BG. Revised diagnostic criteria for neuromyelitis optica. Neurology. 2006 May 23. 66(10):1485-9. [Medline]. Cree B. Neuromyelitis optica: diagnosis, pathogenesis, and treatment. Current Neurology & Neuroscience Reports. Sep/2008. 8(5):427-33. Kattah JC, Gujrati M. Neuromyelitis optica and autoimmune diseases. Arch Neurol. 2008 Jul. 65(7):995-6; author reply 996. [Medline]. Frederiksen JL, Larsson HB, Henriksen O, Olesen J. Magnetic resonance imaging of the brain in patients with acute monosymptomatic optic neuritis. Acta Neurol Scand. 1989 Dec. 80(6):512-7. [Medline]. CHAMPS Study Group. MRI predictors of early conversion to clinically definite MS in the CHAMPS placebo group. Neurology. 2002 Oct 8. 59(7):998-1005. [Medline]. Optic Neuritis Study Group. The clinical profile of optic neuritis. Experience of the Optic Neuritis Treatment Trial. Optic Neuritis Study Group. Arch Ophthalmol. 1991 Dec. 109(12):1673-8. [Medline]. Optic Neuritis Study Group. Long-term brain magnetic resonance imaging changes after optic neuritis in patients without clinically definite multiple sclerosis. Arch Neurol. 2004 Oct. 61(10):1538-41. [Medline]. Beck RW. Optic neuritis: Clinical considerations and the relationship to multiple sclerosis. Neuro-ophthalmology. 1998. 20.1-20.3. Sorensen TL, Frederiksen JL, Bronnum-Hansen H, Petersen HC. Optic neuritis as onset manifestation of multiple sclerosis: a nationwide, long-term survey. Neurology. 1999 Aug 11. 53(3):473-8. [Medline]. Kountakis SE, Maillard AA, Stiernberg CM. Optic neuritis secondary to sphenoethmoiditis: surgical treatment. Am J Otolaryngol. 1995 Nov-Dec. 16(6):422-7. [Medline]. Monteiro ML, Borges WI, do Val Ferreira Ramos C, Lucato LT, Leite CC. Bilateral optic neuritis in wegener granulomatosis. J Neuroophthalmol. 2005 Mar. 25(1):25-8. [Medline]. Nakamoto BK, Dorotheo EU, Biousse V, Tang RA, Schiffman JS, Newman NJ. Progressive outer retinal necrosis presenting with isolated optic neuropathy. Neurology. 2004 Dec 28. 63(12):2423-5. [Medline]. Rush JA, Kennerdell JS, Martinez AJ. Primary idiopathic inflammation of the optic nerve. Am J Ophthalmol. 1982 Mar. 93(3):312-6. [Medline]. Sanborn GE, Kivlin JD, Stevens M. Optic neuritis secondary to sinus disease. Arch Otolaryngol. 1984 Dec. 110(12):816-9. [Medline]. Selbst RG, Selhorst JB, Harbison JW, Myer EC. Parainfectious optic neuritis. Report and review following varicella. Arch Neurol. 1983 Jun. 40(6):347-50. [Medline]. Lee SB, Lee EK, Kim JY. Bilateral optic neuritis in leprosy. Can J Ophthalmol. 2009 Apr. 44(2):219-20. [Medline]. Siddiqui J, Rouleau J, Lee AG, Sato Y, Voigt MD. Bilateral optic neuritis in acute hepatitis C. J Neuroophthalmol. 2009 Jun. 29(2):128-33. [Medline]. Lee HS, Choi KD, Lee JE, Park HK. Optic neuritis after Klebsiella pneumonitis and liver abscess. J Neuroophthalmol. 2009 Jun. 29(2):134-5. [Medline]. Rizzo JF 3rd, Lessell S. Optic neuritis and ischemic optic neuropathy. Overlapping clinical profiles. Arch Ophthalmol. 1991 Dec. 109(12):1668-72. [Medline]. Lennon VA, Kryzer TJ, Pittock SJ, Verkman AS, Hinson SR. IgG marker of optic-spinal multiple sclerosis binds to the aquaporin-4 water channel. J Exp Med. 2005 Aug 15. 202(4):473-7. [Medline]. Lennon VA, Wingerchuk DM, Kryzer TJ, et al. A serum autoantibody marker of neuromyelitis optica: distinction from multiple sclerosis. Lancet. 2004 Dec 11-17. 364(9451):2106-12. [Medline]. Beck RW, Trobe JD, Moke PS, et al. High- and low-risk profiles for the development of multiple sclerosis within 10 years after optic neuritis: experience of the optic neuritis treatment trial. Arch Ophthalmol. 2003 Jul. 121(7):944-9. [Medline]. Trobe JD, Sieving PC, Guire KE, Fendrick AM. The impact of the optic neuritis treatment trial on the practices of ophthalmologists and neurologists. Ophthalmology. 1999 Nov. 106(11):2047-53. [Medline]. Pittock SJ, Weinshenker BG, Lucchinetti CF, Wingerchuk DM, Corboy JR, Lennon VA. Neuromyelitis optica brain lesions localized at sites of high aquaporin 4 expression. Arch Neurol. 2006 Jul. 63(7):964-8. [Medline]. Matsushita T, Isobe N, Matsuoka T, et al. Aquaporin-4 autoimmune syndrome and anti-aquaporin-4 antibody-negative opticospinal multiple sclerosis in Japanese. Mult Scler. 2009 Jul. 15(7):834-47. [Medline]. Jarius S, Ruprecht K, Wildemann B, Kuempfel T, Ringelstein M, Geis C, et al. Contrasting disease patterns in seropositive and seronegative neuromyelitis optica: A multicentre study of 175 patients. J Neuroinflammation. 2012 Jan 19. 9(1):14. [Medline]. Koch-Henriksen N, Hyllested K. Epidemiology of multiple sclerosis: incidence and prevalence rates in Denmark 1948-64 based on the Danish Multiple Sclerosis Registry. Acta Neurol Scand. 1988 Nov. 78(5):369-80. [Medline]. Levin LA, Lessell S. Optic neuritis and multiple sclerosis. Arch Ophthalmol. 2003 Jul. 121(7):1039-40. [Medline]. Levin LA, Lessell S. Risk of multiple sclerosis after optic neuritis. JAMA. 2003 Jul 16. 290(3):403-4. [Medline]. Warner JE, Lessell S, Rizzo JF 3rd, Newman NJ. Does optic disc appearance distinguish ischemic optic neuropathy from optic neuritis?. Arch Ophthalmol. 1997 Nov. 115(11):1408-10. [Medline]. Tátrai E, Simó M, Iljicsov A, Németh J, Debuc DC, Somfai GM. In vivo evaluation of retinal neurodegeneration in patients with multiple sclerosis. PLoS One. 2012. 7(1):e30922. [Medline]. [Full Text]. Söderström M, Ya-Ping J, Hillert J, Link H. Optic neuritis: prognosis for multiple sclerosis from MRI, CSF, and HLA findings. Neurology. 1998 Mar. 50(3):708-14. [Medline]. Cornblath WT, Quint DJ. MRI of optic nerve enlargement in optic neuritis. Neurology. 1997 Apr. 48(4):821-5. [Medline]. Frederiksen JL, Larsson HB, Olesen J. Correlation of magnetic resonance imaging and CSF findings in patients with acute monosymptomatic optic neuritis. Acta Neurol Scand. 1992 Sep. 86(3):317-22. [Medline]. Hickman SJ, Toosy AT, Jones SJ, et al. A serial MRI study following optic nerve mean area in acute optic neuritis. Brain. 2004 Nov. 127:2498-505. [Medline]. Ergene E, Rupp FW Jr, Qualls CR, Ford CC. Acute optic neuritis: association with paranasal sinus inflammatory changes on magnetic resonance imaging. J Neuroimaging. 2000 Oct. 10(4):209-15. [Medline]. Ormerod IE, McDonald WI, du Boulay GH, et al. Disseminated lesions at presentation in patients with optic neuritis. J Neurol Neurosurg Psychiatry. 1986 Feb. 49(2):124-7. [Medline]. Nielsen K, Rostrup E, Frederiksen JL, et al. Magnetic resonance imaging at 3.0 tesla detects more lesions in acute optic neuritis than at 1.5 tesla. Invest Radiol. 2006 Feb. 41(2):76-82. [Medline]. Pittock SJ, Lennon VA, Krecke K, Wingerchuk DM, Lucchinetti CF, Weinshenker BG. 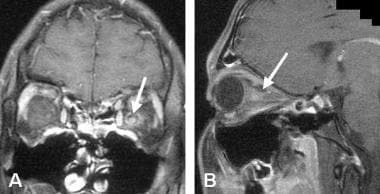 Brain abnormalities in neuromyelitis optica. Arch Neurol. 2006 Mar. 63(3):390-6. [Medline]. Diem R, Molnar F, Beisse F, Gross N, Drüschler K, Heinrich SP, et al. Treatment of optic neuritis with erythropoietin (TONE): a randomised, double-blind, placebo-controlled trial-study protocol. BMJ Open. 2016 Mar 1. 6 (3):e010956. [Medline]. Collongues N, de Seze J. An update on the evidence for the efficacy and safety of rituximab in the management of neuromyelitis optica. Ther Adv Neurol Disord. 2016 May. 9 (3):180-8. [Medline]. Kim SH, Kim W, Park MS, Sohn EH, Li XF, Kim HJ. Efficacy and safety of mitoxantrone in patients with highly relapsing neuromyelitis optica. Arch Neurol. 2011 Apr. 68(4):473-9. [Medline]. Morrow MJ, Ko MW. Should Oral Corticosteroids Be Used to Treat Demyelinating Optic Neuritis?. J Neuroophthalmol. 2017 Dec. 37 (4):444-450. [Medline]. Naumovska M, Sheikh R, Bengtsson B, Malmsjö M, Hammar B. Visual outcome is similar in optic neuritis patients treated with oral and i.v. high-dose methylprednisolone: a retrospective study on 56 patients. BMC Neurol. 2018 Sep 29. 18 (1):160. [Medline]. Watanabe S, Nakashima I, Misu T, Miyazawa I, Shiga Y, Fujihara K. Therapeutic efficacy of plasma exchange in NMO-IgG-positive patients with neuromyelitis optica. Mult Scler. 2007 Jan. 13(1):128-32. [Medline]. Ruprecht K, Klinker E, Dintelmann T, Rieckmann P, Gold R. Plasma exchange for severe optic neuritis: treatment of 10 patients. Neurology. 2004 Sep 28. 63(6):1081-3. [Medline]. McKinney AM, Lohman BD, Sarikaya B, Benson M, Benson MT, Lee MS. Accuracy of routine fat-suppressed FLAIR and diffusion-weighted images in detecting clinically evident optic neuritis. Acta Radiol. 2013 Feb 5. [Medline]. Wilhelm H, Schabet M. The Diagnosis and Treatment of Optic Neuritis. Dtsch Arztebl Int. 2015 Sep 11. 112 (37):616-26. [Medline].